One of the best features of hosted virtual desktops is their ability to work from pretty much any computing device as long as it has an internet connection. Hosted Virtual Desktops enable your employees to securely communicate and have access to key business applications from pretty much anywhere. Ongoing Operations believes that Hosted Virtual Desktop is the future of how organizations will deliver applications and technology tools to their employees. A hosted infrastructure is only possible if the applications, databases, and data you are hosting are available to your employees in a unified and streamlined way. We are firm believers in what we sell and have used it for years. It isn’t perfect but we find it is generally a huge improvement and offers huge performance, security, and flexibility gains over traditional PC based environments. Basically, there are two ways to connect to virtual desktops. First, logon to the internet – from your home, hotel, starbucks, plane (yes we have tried it), and anyplace else. If you have a mobile device you probably will need to download the Citrix Application. You can either go into an App store or go to login.cloudworks.com and the application will install. Then just login with your username and password and wait about 20 seconds. 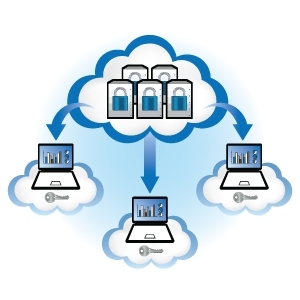 Your Cloudworks’ Hosted Virtual Desktop will launch and all of your files, applications, and data are right there. How Much Bandwidth do I need for Virtual Desktop Hosting? How do Large Spreadsheets Perform in Virtual Desktop?